Back to the beginning. In november 1978 the first episode of Rork appears in Tintin/Hello BD (fr); Kuifje (nl): Un siècle pour une maison. A promising work of the young artist Andreas, that draws attention mainly by a mature drawing technique and the well told story. The first Rork story of Andreas is promising, and the following stories will only get better. Who then expects that Andreas will become one of Tintin/Hello BD (fr); Kuifje (nl)'s heroes is mistaken: 'Rork' hasn't entered a single reader's top ten. For one thing, this is because Andreas' stories are not easy. Drawings and text require concentrated reading, and that invokes a near death sentence at the redaction of Tintin/Hello BD (fr); Kuifje (nl). It cannot be a coincidence that the brilliant 'Rork' stories are replaced by the more artificial and rather boring story La caverne du souvenir. Just like the intriguing stories of 'Wen' (by Eric) have been replaced by the adventures of 'Fool' (site-editor: Dutch: Dwaaskop). 13 Stories of Rork were placed over a period of three-and-a-half year, with an occasional year-long inter-episode period. In the beginning, at the time of the stories that were later bundled into the first book, Fragments, this caused few problems for the readers, since these stories were rather autonomous. Any way, the infrequent appearance did the recognition, and thus the popularity, no good. The later stories, to be bundled in Passages, are connected and reflect previous episodes repeatedly. By means of flashbacks Rork's past is unveiled, and the complete history is finished. That was impossible to trace in Tintin/Hello BD (fr); Kuifje (nl). The later stories of Rork are too hard (or rather: too subtle) to be published in a scattered way. Not only the redaction, that waited up to a year before publishing stories, is to blame, but mainly Andreas, a perfectionist who never wants to be satisfied with a result. Whether 'Rork' will come back is unclear. A mysterious, autonomous episode has appeared in Super Tintin/Kuifje 18: Cosmos (1982), but in Tintin/Hello BD (fr); Kuifje (nl) the 14th episode was never placed. It forms the final act of the cycle and in it all lines of the story will meet. This episode concludes book two, Passages that will appear in September. Up to then all readers of Tintin/Hello BD (fr); Kuifje (nl) will have to wait for the unravelling of the story. Despite all shortcomings of publication frequency (by one Tintin reader even called the Rork-syndrome) the fact that Rork is stopped is a great loss to Tintin/Hello BD (fr); Kuifje (nl). We think the readers of the albums Fragments and Passages can agree to this. Rork is, as we have seen, a magician. The master of dreams has initiated him "in countless secrets from books that (he has) only seen at his place" (Le cimetière des géants). The initiation of the magician has a different purpose then that of the believer. In the same way religious man believes and reverently approaches to superhuman in astonishment, the magician wants to acquire knowledge to get control over the supernatural, powers from different worlds. Where religion bases itself on belief, magic basis itself on knowledge. Knowledge of the supernatural is written in books an initiate can read. We see Rork often absorbed by books. But for the same reason his enemy Ebenezer, in Le retour de la tache sets fire and later tells Rork: "I really only wanted to burn your books...since that is where you could have learned the secret of miss Darkthorn's powers and develop a counterforce." To the magician the science of the supernatural is not an impossibility, since everything reflects everything: for example we can trace matters of this world in the constellation of the stars (the macrocosmos) or in the intestines of an animal or the cards in a deal of cards (the microcosmos). To the magician it holds: as above, so below. Rork possesses a lot of knowledge. That knowledge brings with it many dangers. Point fatal starts with the line: "Rork knows that even in the loneliness of his own home he isn't safe to a sudden interruption by unknown forces, that seem to observe him continuously". In Le cimetière des géants Tanemanar says about the knowledge (of passages) that Rork is to gain that he will carry this as a "continuous threat". You can't just say Rork is the story of a lost soul from another universe desperately trying to return. That would be too simple, since Andreas Martens has, as spiritual father of 'Rork', let us known more than once, not to do any concessions to his readers. 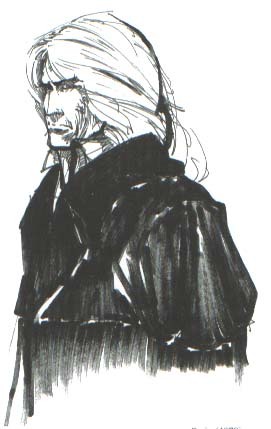 Yet it is all too easy as well to depict Rork as a Faust-story with a modern, silverhaired Cagliostro. If there exists a relationship at all between Goethe's 'Faust' and 'Rork', it goes no further then the passing of the border to another world (death). An interesting world of course, yet one that offers few paths through the entrance. Rork is not only a personage from a story, he is also a "token, or thought, in the sence of creation", we read in Capricorne, page 24. The adventures of the main character hence are linked to what the thought or the idea has to endure. Where the personage Rork steps from one world into the next, we can wonder through which worlds the idea Rork travels. When the person Rork fights his enemy Mordor Gott, it could be nice to know the relationship between the idea Rork and crime. And when the person unveils the secret of the cathedrales' cemetery, the idea takes on a position against religion. Rork is of course in the first place about a remarkable man that has the possibility to travel from one world to the other, or rather to pass. This passing is at the same time restricted: it can only be done when you are initiated and it can only be done twice. Anyone passing more than twice has to face Pharass, the guardian of the secret of passing. In Passages the inevitable happens: the person Rork passes once to many and is tracked down by Pharass, who takes away the (memory of the) secret, yet cannot prevent that Rork crosses once more and as a result is caught between two worlds. Which implies that there is a Nomansland between two or more worlds. This is the information we get from the first two parts of the cycle. Fragments and Passages can thus be regarded as an introduction to the rest of the cycle. This separation is confirmed in several ways. As not to divert too much, I recall only two of these ways: from Le cimetière de cathédrales the cycle counts from Rork 1 to Rork 5; and from Rork 1 every part has a clear prologue (Retour has no prologue but an epilogue) and a framework conversation held by two owls. In Le cimetière de cathédrales Rork appears to be not as lost as is suggested at the end of Passages. He is merely held captive by the 'liers of Vree' who regard themselves as the conscience of worlds or even that of fate. Rork is accused of disturbing the balance in his universe and "a universe that is off balance wavers other universes" (amongst which the one of the liers of Vree. Le cimetière de cathédrales p. 15). Therefore Rork is sent back to his own world to restore order. Once back in his world he engages in several meaningful surroundings and situations. At first he is stranded somwhere in a jungle where he finds his strength back on a cathedrales' cemetery and meets a future allie. In Lumière d'étoile he refinds Low Valley. In Capricorne a confrontation with organized crime follows and an alliance with the astrologer Capricorne, in Descente he finds himself in a spaceship that is hidden under the ice of the polar area. In Retour, at last, a good attempt is made to tie together all loose ends. When we follow the threads of the story, a number of things that are of interest to the idea Rork return again and again. To start with, there is the generally mythical, that is at one time expressed by underwatermen (Atlantians?) and at another time by extraterrestrial powers or earthly forces. Furthermore there are passages that curiously always are connected to death. For instance, the first passage starts with the death of a ferryman (markable detail: the captain that shows Rork where to go somewhat later turns out to be dead as well) and the second passage is accompanied by the suffocation of Rork. The third time Rork is literally crushed and when Rork at the fourth time is sent back by the 'liers of Vree', this passage coincides again with the end of a life (that of 'Levec' through the very remarkable detour of the poisoning of Miss McKee who thereby avoids a certain death). Then there is the passage of the emissary of Vree in Capricorne (the man dies directly at arrival) and the passage of Rork in Descente that saves him (of a certain death?). And finally the passages in Retour can similarly be connected with death. It seems obvious that Andreas uses passages to symbolize a kind of controlled dying. Except for the inexplicable and death we are regularly confronted with all kinds of religious aspects. This starts in Fragments when Rork enters a subterranean temple, in chapter 4. The religious references only become clear in Le cimetière de cathédrales, in which the keepers of the dungeon (Mordor Gott, the criminal from Capricorne? ), the liers of Vree (in priest's garment) and the cathedrales are obvious religious elements. But there are further elements. In Lumière d'étoile Low Valley is called a priestess of initiation, in Capricorne we meet Mordor Gott and his cubic temple and in Retour not only some rituals come to the attention, but several other religiocities are repeated partially. Then there is the theme of appearance and reality. The most concise clue to this is the passage of Raffington Event at page 7 of Passages. The man enters Rork's house to immediately step out of it again...to turn back again by a different way!!! And Rork's comment at page 9 is no less concise: "Let's say that you and your contemporaries are too quick to assume what they see... As soon as one knows what it is you want to see, one can make you believe anything. Be on your guard." And from that moment on it is a great gamble to the attentive reader where Rork is about appearance, or about reality. What at least appears to be real, is the neverending fight between good and evil that is elaborated in Capricorne as theme of so called pulp fiction novels. By the way, it is in this part that religion is degraded to mafia and the strongest clue is the person Kenton. This Kenton is porteyed in the pulp novel as an aid of the criminal Mordor Gott (in monk's frock) and can furter on in the strip be found on the side of the good guy Capricorne. This betrayal towards Gott costs him time and again a piece of a finger, a ritual that is used in cases of betrayal with the Yakuza, the Japanese mafia. As a fifth and last theme the theme of time can be pointed out. This theme probably forms the connection between all themes of the Rork-cycle. In Retour this is developed expressly. That is where we learn that a number of places together form the face of a clock and that the grandfather of Wilbur Skiffel had theories about the vibrations of time and consequently designed a gigantic timepiece. One of the mechanisms appears to consist of the places forming the dial and the house of grandad Skiffel that is build L-shaped and thus forms the hands of the clock. When grandson Wilbur starts this special mechanism, vibrations are created that coincide with the release of a gigantic monster, that appears to be the creature that was locked up; in the subterranean temple of Low Valley. By summing up the different themes we still don't know how to associate these with the idea Rork that all this was about. The answer most likely can be found in the last part: Retour. In Retour we get for the first time answers about Rork's origin and about the contents of the thought behind Rork. At page 44 we can read for example that Rork comes from a world where quietness rules and from which at a certain moment he is born, without the interference of biological parents, into our world. What eventually is his mission in this world remains rather dark, yet from what Rork says to Dahmaloch at page 53, we can confidently conclude that it is his task to save the world from destruction. The danger threatening the world is that man could succeed in achieving chaos or perfection. According to Rork it is rather the road from one thing to the next that is the ground for man's existence. Rork states himself as a saviour to a possible drifting off to hell and the devil. Rork the idea, the thought, as it appears from his words at page 53, should actually be seen as resistence against the temptations of the devil (this is of course where Faust comes in). Remains the question what temptations are presented to us by the devil. At page 45 we get a clue to this. Rork there tells a dying Low Valley: "in what kind of world are we living, that bleeds and dies the moment it comes in contact with reality?! Let's hope, Low, that the dreamer doesn't dream forever! That he wakes up one day and sees things as they are and not as he wants to dream them, under the pretence that life is what he wants, not what he is! All we do here is mere cheap mysticism..."
- finally there is the mysticism about the fight between good and evil that takes place at different levels, yet finally culminates in the fight between Rork and Dahmaloch. The question is only whether that fight is not really a fight between evil and evil, since the essence of evil seems to take posession of Rork's body at page 38 of Retour. However it may be, the mysticism of this fight is not very clear, unless one seeks it in the fact that the fight originates in the quest for absolute power by those who want to use the power to their own advantage. Remains the theme of time that plays an important part in Retour. This time invokes questions, like the other themes have. What is this: time? Is that a solution to the problem of chaos (the liers of Vree form a timecircle at page 11 as a last resort to the upcoming downfall of their universe)? Is it also a passage to other worlds? Is it a carrier of mans road to hell and doom? Whoever knows, may say so. It's impossible to try to explain the entire Rork-saga. There are too many palliatives and last resorts in it, because the first two parts, Fragments and Passages were meant to be autonomous by Andreas. Only several years later Andreas picked up the thread of Rork with Le cimetière de cathédrales and succeeded to make a well constructed whole of it. Despite the palliatives and last resorts in the story, Andreas does present a vision with Rork. An vision on reality and creation. 'Rork' means token or thought, in the sense of idea, creation (Capricorne, p.24). Tokens are eventually the only thing that remains of the entire Rork-saga (Retour, p. 56). Rork is thus something universal, a universal train of thought. In any case it is immediately clear that Rork is not human. He is several hundreds years old and possesses the power to travel between several worlds through so called passages. At the end of Retour, the last album of the series, Rork commits suicide by jumping of the skyscraper of Capricorne (p.54, pl. 1). This jump is Rork's last passage, he returns to his own world as owl. Earlier on Rork had discovered who he really is. At first he recognizes a token on a wall in the sewers of New York, that clears the fog in his mind (Capricorne, p.36). Later in the spaceship on the South Pole all things come together when Rork looks in the mirror (Descente, p.49). The token reminds Raffington Event of two birds (Retour, p.44). "Indeed", answers Rork to this. The token thus simply represents the two owls that are waiting at the beginning and end of every Rork-album since Le cimetière de cathédrales for the return of a loved one. This loved one is Rork and eventually Rork will indeed return to the owls, to his own world. What, then, is this world of Rork? He himself says to his friend raffington Event at page 44 of Retour: "In my world rules quietness. But sometimes the sound of large, wooden pipes awakes us... It happens seldomly and the last time it created confusion at first. A threat that was outlined against the horizon entered through your world. Now I know it was only an illusion. When the spirits had calmed down, I was taken through a passage. It was my first time, I was inexperienced. At the end of the tunnel, I was only a baby." This explaines how Rork suddenly entered our world as a foundling (Passages, p. 10). He entered our world to stop a danger, a danger that is personified in Dahmaloch and eventually appears to be nothing more than an illusion. Pharras, (a pawn of Dahmaloch) tries more than once in vain to disable Rork. The original world of Rork is one of ideas and symbols. Significantly, the owl is the symbol of wisdom and is the meaning of Rork's name idea. Besides wisdom, the owl symbolizes death. [1) Andreas himself wrote about the owl as symbol: "I wanted to use birds in Rork and opened a birds encyclopaedia. I saw a picture of two owls and found them suitable. I was just looking for a strong image, like I found a cathedrales cemetery a strong image. In hindsight the symbolism of the owl came in very handy."] Significantly Rork returns to his world only after his suicide action. Rork entered our world, after being awakened by the sound of large, wooden pipes. Since the era of Enlightenment we in Western Europe think everything can be explained by human ratio. This train of thought lead to a view of the earth as on ordinary lump of clay without mythical elements and without a god. At page 12 of Passages young Rork leaves this rationalistic progress-thought, by posing that there aren't as many answers as their are questions, but that there is always one question more. With this, Andreas makes clear in one sentence in what kind of a world Rork has landed. Rork lives in a cosmological world, one in which human reasoning hasn't demythologized life. Rorks world is filled with mystery and unearthly matters. Thus the human race appears in Fragments to be not the only intelligent race on this earth [2) This horror-element originates with H.P. Lovecraft Lovecraft, an American writer that had a great influence on Andreas. This horror-author outlines in his 'Chtulhu'-saga a higher intelligence, that lived on this earth before man did. Just like in Rork the creatures awake to regain their place. By the way, this motive we find in Andreas' Cromwell Stone as well] and do some people possess supernatural gifts. Further, the people in Rork never get a grip on the world around them. There are higher intelligences and forces of nature against which they are worsted. Thus, the remedy against the stain in Fragments appears insufficiently fit to stand against the power of this being and are the scientists in Descente unable to cope with the intelligence of the alien spaceship. Rork knows that man doesn't live in reality but in a self-made reality. Thus everything appears to be nothing more than mysticism, an illusion. At page 53 of Retour he confronts the illusion of evil, Dahmaloch. "I can see now that everything depends on me," says Rork. "From my resistence against your machinations You have drawn strength and energy. But things turned out different from what you expected and now You hope to satisfy Your ambitions through a duel. If I accept, I only strengthen the famous ideas of devil and hell. Man was not created for chaos or perfection. The reason for his existence is the road that leads from one thing to the next. Only his attempts give him the strength to live. If he succeeds, this is the end of the world. Whoever you are, You nearly made it. Nearly. Well, Your accomplices have killed themselves... You can do the same thing yourself." Following this Rork kills himself by jumping of the skyscraper. Dahmaloch is eaten by the ferryman. With the denial of the idea Dahmaloch, the Dahmaloch evil has disappeared as well. What then is Andreas' message? Man doesn't understand his world. This much is clear. Not only does Rork say this in his last words to Low Valley, he has also - by saying that their is always an unanswered question - pointed out in Passages that life is inexplicable. Andreas' message is a philosophic one, comparable to the German philosopher Arthur Schopenhauer (1788- 1860). According to this thinker the world consists of two layers: that of will and representation. The world of will is the true world, that underlies every idea man suggests about what this true world really is. Every representation of life creates its own reality. The will is within ourselves and is inexplicable, it is the urge that leads us from one thing to the next. Man nevertheless seeks desperately for an explanation for that will. He forms ideas of religion (Le cimetière de cathédrales), gods of nature (Lumière d'étoile), fate (the astrology of 'Capricorne') or a extraterrestrial power (the spaceship in Descente). All these ideas are only cheap mysticism. The more so because the reality that is created by such an idea starts to live a life of its own. Eventually Rork sees that evil, personified in Dahmaloch, can only exist because man forms an idea about it. By realizing this Rork eventually saves the world. The first episodes of Rork appeared short after Udolfo. Yet, a difference of style was immediately visible. It didn't look like Paape. Andreas: I asked André-Paul Duchâteau, who was chief editor of Tintin/Hello BD (fr); Kuifje (nl) back then, if I could make	something for him. He said "yes" and accepted my proposal about Rork - at least, he could more or less agree with it. So, the first two, three episodes I made when he was still chief editor. Rork was influenced by American comics, which I liked and still like: a bit of adventure, relatively classic comics. Rork was of course the first thing I made entirely by myself. That's why it was important to me. I worked hard on it, put a lot of energy in those first episodes. It was not great, but it was the best I could do at the time. How were your contacts with the other comics writers of Tintin/Hello BD (fr); Kuifje (nl)? Was Rork well received? Tintin/Hello BD (fr); Kuifje (nl) was then not what it had been. Greg was no longer chief editor. The haydays were gone when André-Paul Duchâteau succeeded him. After that Vernal took over and the quality deteriorated even more. The editors were very uninterested. When you delivered the plates you were told: "Yeah, yeah, put them over there!" Nobody was really interested in them. Moreover, they published Rork pretty carelessly. Between two episodes was sometimes a hole of six months, so the readers couldn't understand anything about it any more. They already thought it was "hard", so you can imagine what such a frequency of appearance could do... At the popularity poll I was not even part of the first fifty. I believe that Rork was not at the right place at Tintin/Hello BD (fr); Kuifje (nl). The comic was appreciated by other authors, at least so I heard here and there. You announced that they were going to be five albums. Did you know at the time how the series would finish? Andreas: I didn't know exactly how it would end, only just about so. I had a rough idea of what would happen in time, but not where and how: an adventure that would end in a certain way - a regrouping of all elements - like the beginning of something new. I don't know if I foresaw Capricorne from the beginning, but of the first two albums I knew at least how they would go. In Andreas' strips people are always looking for something, the detection of a murder-offender, a key of the entrance to another world. Andreas calls them mysteries and suspects that he won't make different kinds of strips any time soon. "All my projects have the same base: people are looking for solutions. I love mysteries and fantastic tales. I have read many books in these genres, and I have sought intensely for literature that I didn't know yet. Until I discovered H.P. Lovecraft, then I stopped, that was the top for me. The mystery, the greatness, the dark forces of his stories, that has influenced me. Almost simultanuously, and it probably wasn't a coincidence, I started the Rork-cycle."